The Earl Klugh program, instrument demonstrations and concerts are included with museum admission and free to museum members; admission to the film screenings is free. Visit the museum's website for complete admission details. Renowned for his sweet tone and his mastery of the acoustic guitar, Grammy Award-winner Earl Klugh ranks as one of the world's finest guitarists. He was barely a teen in Detroit when he was awestruck by seeing Atkins play guitar on television. After meeting in the late 1970s, Klugh and Atkins collaborated frequently. "Earl can wail with the best," Atkins told Guitar Player magazine, "but he prefers to touch people emotionally. He reaches your heart with that romantic special something." On Saturday, July 7, the museum will pay tribute to Atkins' thumbpicking inspiration, Merle Travis, with the concert Muhlenburg County Thumbpickers, a reference to Travis' birthplace in Kentucky. Award-winning Muhlenburg County-area guitarists Joe Hudson, Paul Mosely, Eddie Pennington and Freddie Russell will perform. On Saturday, July 14, at 1:30 p.m., Chet Atkins: Friends and Flame Keepers will honor Atkins' legacy as a generous teacher, collaborator, and even a student of other guitarists. The concert will highlight the relationships forged and nurtured around Atkins' music, as well as the artists who are carrying on and expanding Atkins' guitar style. Performers include John Knowles, c.g.p., Guy Van Duser, Thom Bresh with Brooks Robertson, Ben Hall with Megan Taylor Anderson and more. Sunday, June 24 - 2:00 p.m.
Chet Atkins fronts an ace band and hosts this concert special, originally recorded for television in Nashville. Guest performers include the Everly Brothers, Emmylou Harris, Waylon Jennings, Mark Knopfler, Michael McDonald, Willie Nelson, and others. 60 Minutes. Free. Saturday, June 30 - 1:30 p.m.
Grammy-winning guitarist Earl Klugh will perform solo in tribute to his hero, Chet Atkins. This concert will be streamed live at www.CountryMusicHallOfFame.org. Following the program, Klugh will sign copies of his CDs and a limited edition Hatch Show Print. This colorful episode of The Jerry Reed Show features performances by and interviews with Lynn Anderson, Atkins, Jerry Clower, and Terry McMillan. Reed performs "Baby's Coming Home" with Atkins, and all the guests join in on "Thank God I'm a Country Boy." The live house band is conducted by Bill Justis. 45 minutes. Free. Chet Atkins was inspired by the complex fingerstyle guitar playing of Merle Travis called "thumbpicking." This guitar style has been developed, passed down, preserved, and expanded by generations of players around Travis's birthplace in Muhlenburg County, Kentucky. Award-winning Muhlenburg area guitarists Joe Hudson, Paul Mosely, Eddie Pennington, and Freddie Russell will perform. Sunday, July 8 - 1:00 p.m.
Sunday, July 8 - 2:00 p.m. In the early 20th century a few guitar players in Western Kentucky developed a unique style of guitar playing that used the thumb to pick out a steady bass rhythm while the first finger played a melody. This style, which became known as "thumbpicking" was popularized by Capitol Records recording artist and Muhlenburg County native Merle Travis, and had a significant influence on Chet Atkins. This film features stories and performances from eight Kentucky thumbpickers, some of whom have been playing since the time Travis rose to stardom, while others are from a younger generation of guitarists who have carried on and expanded this traditional style. 52 minutes. Free. 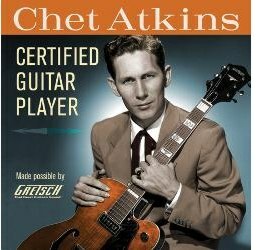 Chet Atkins was known as an innovative guitarist, as a producer who helped define the Nashville Sound, and as a generous teacher, collaborator, and even a student of other guitarists. This concert will highlight the relationships that have been sparked and continue to grow around Chet's music, as well as the artists who are carrying on and expanding Chet's guitar style. Performers include John Knowles, c.g.p., Guy Van Duser, Thom Bresh with Brooks Robertson, Ben Hall with Megan Taylor Anderson, and more. Sunday, July 15 - 1:00 p.m.
Sunday, July 15 - 2:00 p.m. In this episode of the long-running public television series, Atkins demonstrates his trademark guitar style as well his love of collaboration. His guests include Thom Bresh, Larry Carlton, Johnny Gimble, Peter Ostroushko, Butch Thompson, and the Prairie Home Companion Band. Free. These programs are made possible, in part, by grants from the Metropolitan Nashville Arts Commission and by an agreement between the Tennessee Arts Commission and the National Endowment for the Arts. Film screenings are made possible by Iron Mountain Film and Sound Archives. More information about the Country Music Hall of Fame® and Museum is available at www.CountryMusicHallOfFame.org or by calling (615) 416-2001.bTuesday, July 10 - 1:00 p.m.